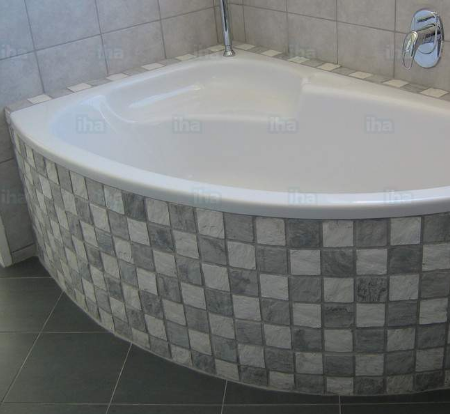 Before you begin, you’ll want to make sure the area for your tub has sufficient subflooring. If there are any rotten or broken pieces, replace them with fresh wood. Next, make sure the plumbing fittings are in place for where you want to install your tub. If not, hire a plumber to adjust them properly. Refer to your bathtub manufacturer’s framing instructions and decide on your framing layout. Using your saw, cut your lumber into pieces that fit the size of your frame. Attach the pieces together using screws and a screwdriver. Next, use your studfinder to locate the studs in your corner wall. Before you attach your frame to your corner wall, have a friend help you lift your bathtub and place it in the frame to make sure it fits well. If it doesn’t make the necessary adjustments. After that, attach your frame to the wall using your screwdriver and screws. Prepare your mortar mix and spread a thin layer inside of your frame. Have your friend help you lift your bathtub up and place it inside the frame and onto the area of mortar. Next, place a long level on top of the tub to make sure it’s level. If it’s not, place wooden shims in the areas that need to be elevated until the tub is level. Attach the plumbing fixtures properly, then attach the bathtub to the wall using screws and a screwdriver. Cover the framing with tiles and let dry. Place a bead of waterproof silicone between the bathtub and the tile to seal the area.